UPDATE!!!! WE ARE READY TO RECEIVE OUR GUESTS. POWER, WATER AND WI-FI ARE FULLY RESTORED OUR RENOVATED, ULTRA MODERN POOL IS AVAILABLE 24/7. YOU WILL HAVE A RELAXING EXPERIENCE WITH NEW LIGHTS AND CALMING CASCADE. SEVEN SEAS BEACH WHICH IS JUST ACROSS THE STREET, IS SAFE AND CLEAN AS DECLARED BY THE GOVERNMENT ENVIROMENTAL DEPT. ALSO, THE DEPT. OF TOURISM HAS DECLARED THAT PUERTO RICO IS OFICIALLY OPEN FOR TOURISM, SO SAY GOODBYE TO WINTER AND COME TO PUERTO RICO!!!! This is a very exclusive condo, only 30 units. Apt is on second floor, walk up. Very large balcony, with ocean and pool view, very close to El Conquistador Hotel and Resort. You will be 45 min. from the airport, Old San Juan and metropolitan area. Fajardo is a large town with major shopping areas and nice restaurants. Playa Colora and Playa Escondida are secluded beaches within walking distance from the apartment, good for snorkeling and sunbathing. El Yunque is our rainforest, only 15 min. away, you will have a radical change of scenery, they have guided tours and at the Portal a complete introduction to what you will see once you enter the forest. THE MASTER BATHROOM IS VERY AMPLE, BIDET AND TUB EQUIPPED BATHROOM #2 IS COMFORTABLE, ALSO WITH TUB. THE KITCHEN AREA HAS A COUNTERTOP, VERY SUITABLE FOR HAVING YOUR BREAKFAST. We are a family of three and we spent our daughter's (12 yo) spring break at Myrta's place. We have only good things to say about the accommodations and the location as well as the care that Myrta provided. The place was large and airy and in excellent condition. We enjoyed the Seven Seas beach across the street as well as the pool and the local offerings for food, drink and tours. Snorkeling off the beach was some of the best we have experienced. We were also close to the ferry port to Culebra. Myrta provided frequent communications which made us feel welcomed and well cared for. Definitely recommend staying here if you want to experience more of Puerto Rico that just San Juan. I try my best to take care of my guests. We spent a week here with our college aged kids and it was a perfect location for everybody. The beach is just across the road from the property and there you could rent kayaks, snorkel gear and lots of other water toys or take a guided trip so nobody got bored. There are at least 3 stunning beaches you could walk to and a couple of casual places to eat. The biobay kayak tour was stunning and definitely a highlight of our trip. The apartment was very spacious and cool with nice balconies where you could enjoy the shade. We had all the amenities we needed for the week and you do need a car to buy food and see other tourist spots like the rainforest. Fajardo is a fabulous active vacation spot and Myrta's apartment was perfect for us. We would definitely love to plan another trip soon! Our stay at Myrta’s place in Palma Vista was amazing! Myrta went above and beyond to accommodate our family, provided necessities for our toddler and infant, very responsive, the unit was everything we needed and more. Our days started on the balcony looking over the beautiful pool area and manicured grounds of Palma Vista with a view to the ocean. The pool and playground are perfect for any family and a short walk across the street to seven seas beach. As far as the area of Fajardo we are so happy we decided to stay away from San Juan and experience all of the natural wonders Puerto Rico has to offer like the bio bay tour (highly recommend 8pm tour), the ferry to Culebra. I read several negative reviews about the ferry and was hesitant to take a four month old and 2 ye old but so glad we took the chance and did! It was seemless catching the 45 min ferry ride over and bus to Flemenco Beach. I would have to say the absolute best part of our stay was having a great place to return to and relax, some of the best restaurants are less than a mile from this unit and last but not least the people of Puerto Rico are the best! Cannot wait to return! 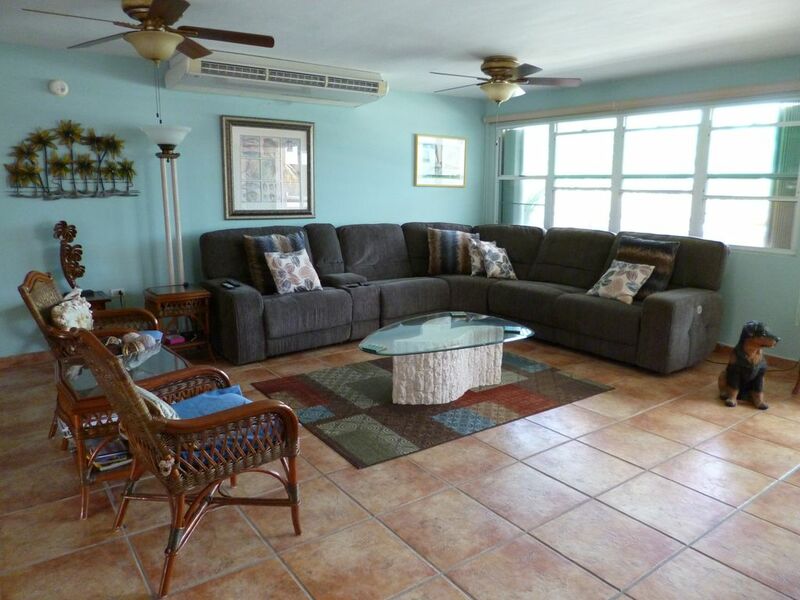 Great property with nice patio for enjoying the view of the pool and ocean. Well furnished. Great location to walk to several beaches, restaurants, paddleboarding, kayaking to the bioluminescent lagoon, etc. Best location on the northeast coast. Nearby restaurants La Estacion and Kasa Vista were great. I strive to make my guests welcome. THE APT. IS LOCATED 5 MINS. FROM STARTING POINT TO KAYAKING TO THE UNIQUE BIOBAY LAGOON AND NATURAL RESERVE.